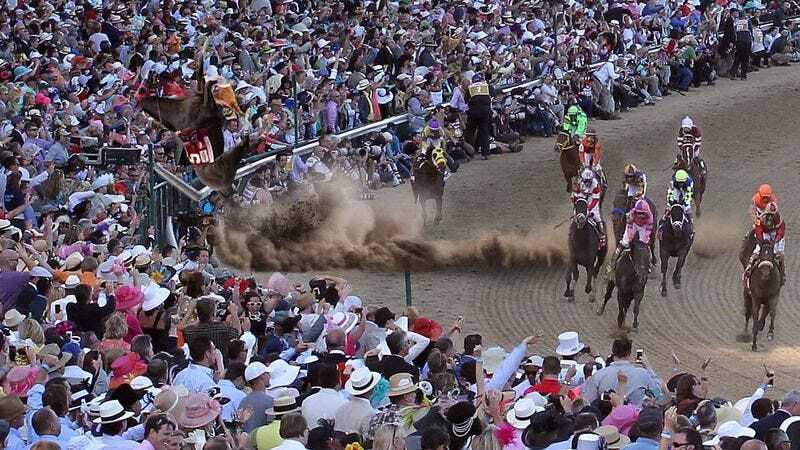 LOUISVILLE, KY—In one of the biggest tragedies to ever befall the 141-year-old event, more than a dozen spectators were reportedly injured and the Kentucky Derby was temporarily delayed Saturday after a pinwheeling, out-of-control horse crashed into the stands. “They were entering the final turn when Keen Ice spun out and hit the wall, sending him airborne and spiraling uncontrollably at full speed into the first few rows of the crowd,” Derby announcer Travis Stone told reporters, adding that paramedics immediately rushed to attend to onlookers struck by debris and extract jockey Kent Desormeaux from the wreckage. “You could see from the way Keen Ice was wildly careening around the top of the stretch that it wasn’t going to end well, and once he made contact with the wall, it was carnage. You try to keep fans safe, but you can’t always prevent these kinds of freak accidents, especially a horse tumbling end-over-end into the crowd like that. It was truly horrifying.” At press time, Derby officials confirmed that, following cleanup of the seven-horse pileup caused by Keen Ice’s crash, the pace horse would be brought out and the race would be finished under the yellow caution flag.